What does it mean to practice with heart? Meet Dr. Resa Caivano. 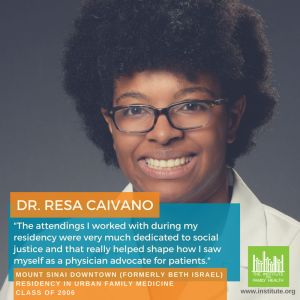 Dr. Caivano graduated from the Institute’s Mount Sinai Downtown (formerly Beth Israel) Residency in Urban Family Medicine program in 2006. Upon graduating, she went on to work for two FQHCs and now works as a family physician for Kaiser Permanente at a clinic in Southern California. She recently spoke with us about how her time in the residency program shaped her as a physician. Dr. Caivano remains committed to serving medically underserved populations. In addition to seeing patients daily, she works with a team of physicians on a project to aid patients with sickle cell disease – which disproportionately affects African-Americans.